A tornado was sighted on the ground in western Boone County at around 5:30 p.m. Friday evening, May 25. 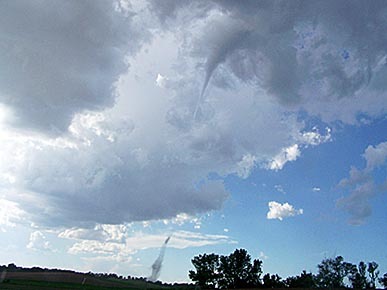 The rope-like tornado was spotted by several observers in the rural countryside west of Loretto / southwest of Petersburg. The tornado remained on the ground for a short time. Damage was undetermined. This photo of the tornado on the ground was taken by Jenice Stevenson near Stevenson’s Ranch.